The moment the SEC stopped talking and started issuing summons’, the US-based ICO-in-progress companies panicked. For 2 weeks, almost 3, nobody in the US was asking me about ICO whitepapers. Next, they capitulated, and we got the usual number of leads, with everyone saying they wanted to do a security token. Finally, they went back to being deluded and telling me all about their two-token economies. Dudes. There. Is. No. Such. Thing. Now, I’m not saying you can’t (or even shouldn’t) have multiple tokens. But if you are doing a security token issue, the security token is your token. Your “utility” token is just a marketing bonus program. I have people calling me up and telling me all about how their utility token is used for bounty programs, promotions, membership benefits, etc. Let’s talk terminology. That’s a coupon. In the best case, it’s a green stamp, you know, the kind they give you in supermarkets and if you collect enough of them, you get a teapot or something. I don’t mean to be snarky and sarcastic, but it reminds me of my days as a child collecting the boxtops codes on cereal boxes and then sending them in for a toy helicopter. (OK, that’s a lie. I do mean to be snarky and sarcastic. That’s because people are calling a cereal-boxtop a “token.” Plus, it’s New York Crypto Week. Let’s all be a bit extra snarky in honor of NYC.) Yes, it’s a token. Just like in New York subways you used to need a token to get through the turnstile. Yeah, I’m old. 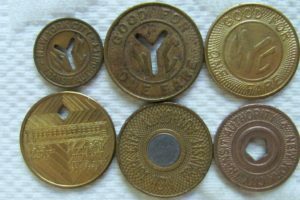 I collected cereal boxtops and used a bi-colored coin in the New York Subways. Your “utility token” is a token, but it’s nothing new, revolutionary, technological, or exciting. It’s just a marketing promotion bonus point. Oh, and you don’t need ERC20 for it, because nobody cares about the immutable record of your non-fungible coupons. I’m looking at my stupid MTA metro card. It’s the only card in my wallet that is so easily bendable that it is constantly getting damaged. You’d think the Big Apple could make a decent card like every other public transportation system in the world. Some of us are really New Yorkers and we are embarrassed by our pathetic MTA card and wish we had tokens. I know I personally would be having a good time being snarky at New York Crypto week with my handful of tokens. Ah, good times. But I diverge. I’ll have to use my plastic Starbucks card to be snarky, as I do below. So, yeah, you can have an ICO with a “security token” (equity, also nothing new or technologically exciting), and a “utility token” (bonus points). But it’s not a two-token economy because (a) a security token isn’t used in your business (b) it’s a business and not an ecosystem, so it doesn’t have an “economy” but is part of a larger economy and (c) there is no interaction between the two tokens so they aren’t part of one economy, even if it were an economy, which it isn’t. “But I could exchange my utility tokens for my security tokens,” said more than one ICO founder to myself. Yeah, and I could take my Starbucks card and buy Starbucks stock with it. Not. No, you can’t exchange your coupons on the exchange, because they are never going to be listed on an exchange. But if you think that you can, I have a Starbucks card I’d like to sell you. 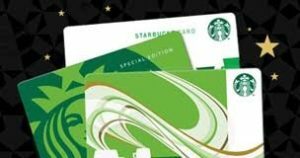 And yes, I could sell my Starbucks card for the amount of money in the card and then take that money and buy Starbucks stock for it. But I’m not expecting atomic swap for that any day soon. Having said all that, there are cases where you want more than one token. The classic example is staking tokens versus utility tokens. Very few organizations have implemented this appropriately, and I’ll probably cover this in a separate blog post, and if you want to hear more about that. (Or check out Crypto Disrupted’s interview of me and Marco, where we talk about this). For this blog post I’ll make it simple. It should be obvious to everyone at this moment in history that voting rights should not be purchasable. If the utility token is also the staking token, someone with money can just buy votes. If you think about “reputation” as equivalent to “work”, you could say my reputation would be the number of dollars that I have earned over my lifetime. That is a very different number than the number of dollars in my bank account. Dollars in my bank account might be earned, inherited, or wisely invested. Or, I might have a negative number of dollars in my bank account but go on a lot of cool vacations. So, even if you want to record tokens earned as a measure of reputation, that’s a different number than tokens held. Outside of staking, I’ve seen some good cases for ICOs with two tokens, but generally they do not have an exchange between them. For example, I’ve seen companies that have security tokens as the basis for the ICO, but they are also using an asset-backed token within their ecosystem/platform. For example, one company I spoke to is doing a supply chain liquidity play. When a company in the US, for example, makes a promise to purchase goods in Malaysia, for example, the US company puts the money in an account and gets tokens, protected by a smartcontract. The money in escrow could be in the fiat currency-of-choice for the supplier, protecting them against currency risk. When the supplier in Malaysia delivers the good (with proof-of-delivery on the chain), the smartcontract transfers the tokens to the supplier. The supplier can cash them for the promised fiat, and the tokens are burned. This is basically an escrow system, and the tokens are not on any kind of exchange, and they are not related to the tokens issued to investors. It’s a great use of an ERC20 token, but it’s not part of the “token economy”. It is, however, a second token that could not be effectively created without DLT technology. I’ve also seen an interesting model of a token economy in an opensource project where the initial investors have non-dilutable tokens and all other tokens are potentially diluted when more investment is made into the platform. The investor’s tokens are non-dilutable to reward initial investors, so if more tokens are released into the economy, the investor gets the requisite amount of newly-minted tokens to keep him at the same percentage of ownership as he had before, but all other tokens are diluted. However, when the investor sells, the token immediately becomes a “normal” token. The tokens are utility token, so the presumption is that if the investor is using the platform, they will want to continue to hold tokens for use in the economy. In that case, they still are active members with the same ownership rights as they always had. However, if they are just selling the tokens for gain, that’s fine, but they lose their percentage of stake in the ecosystem and it’s no longer “purchasable” but only earned in the ecosystem. I haven’t yet seen anything convincing that shows me there is some logical interaction between different tokens inside an ecosystem. That’s probably because a form of currency is, by nature, generic, and should have multiple uses, so you don’t need multiple stores of value within one ecosystem. But I’m happy to be proven wrong. If you know of a case where there is a true two-token economy with a logical function and interaction of the two tokens, I’d love to hear it.